Have you wondered what it takes to be a successful entrepreneur and business owner? Today Kent and Kevin discuss owning your mission, having a 'no excuses' attitude and how to hold yourself accountable for success. Kent reminds us that having the right attitude, the right work ethic, the right desires, and always pursuing results will ensure that you're on the right path. Tune in to hear how mindset and inner accountability were the biggest components in the making of Memphis Invest! We've talked about it before, and we'll say it again. We have signs all around our offices in both Dallas and Memphis that say, "You can have excuses or you can have results'. And we mean it! When Kent talks about owning the mission, it's all about the mindset of the entrepreneur. The success of your mission all really comes back on you, not having any excuses, and being accountable to yourself. A lot of entrepreneurs may think it's easy to start a business; have a little seed money, work a few hours a day, get rich quick, and move on to the next idea or the next startup, but in Kent's experience, it's really not like that. He admits, it's a lot of hard work. Memphis Invest started 14-15 years ago with very little money, and eventually success grew over the years, and financially the business grew more and more healthy. But only because of the years and years of results and accountability that went into creating the business that it is today. 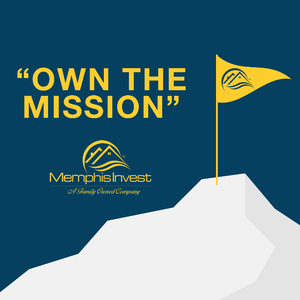 And at Memphis Invest, we ensure that everyone we hire is just as committed to our mission as we are. Keep in mind, when you're talking to somebody, are they going to catch hold of what you're doing and do you feel like they're going to support it when they come in and work for you? You need to make sure that your mission and your goals are being upheld by every member of your team, because like we said in last week's episode, having a good plan and working with good people will make or break your business. Everyone says work smarter and not harder, and that obviously means use your time wisely. But it also doesn't mean you don't have to work hard. You've probably heard the statistic that most small businesses fail within the first year of opening. But if you look at it with an entrepreneurial mindset, you'll see that many businesses fail because the owner starts the company based on solving a problem that's important to them, and didn't get any farther than that. The real effort definitely includes research, and seeing if there's a successful and sustainable business model that can be built. Even after you build your company, in order to achieve long term growth, complacency can't sink in at all. With many first time entrepreneurs, the excitement of initial success can give a false sense of comfort and confidence. In reality, you need to constantly be reinvesting, reinventing and reevaluating your business in order to maintain a steady and scalable growth. Many times entrepreneurs will go years without making any money, and you have to be able to do that in order to reinvest in your company's technology, people and training. Bottom Line: All the hard work, dedication and determination will be worth it in the end, if your mission is something you're truly passionate about and never give up on. Kent Clothier: Hello everyone. Welcome to the Experience Matters podcast. Kent Clothier, Sr. here, your host today. Glad everybody could join us today. Kevin's back here with us. Kevin, how you doing today? Kevin Hommel: I'm doing great. Good to be back. Kent Clothier: Very good. We're going to get into a couple of topics today and talk about it. I want to remind everybody that you can find us on SoundCloud, iTunes, the memphisinvest.com website, Stitcher, and on the memphisinvest website there's the video and the audio, and the rest of those locations are audio. We encourage you to join us and leave any comments for us. I think we're getting up close to number 30 podcast here maybe. I'm not quite sure what the number is. Again, we're glad that our audience joins us and hope some of this free content brings you some sort of information that would be good for you in your everyday business. There may be some personal stuff in here, stuff that you can use, and some of the stuff that we've used in our business to get to where we are today. Kent Clothier: We always like it when you're on here. I don't know where ... We lost you there for a couple of weeks. It's probably my fault, because I was gone, but we're glad you're on here today. I got a couple of things to talk about today and I kind of want to center it around owning the mission that we're trying to do in any business that you have rather than come up with excuses or not accountable as an entrepreneur. It all really comes back on you, in this particular case myself, of owning the mission, not having any excuses, and I'm really the one that's accountable to myself for the success. I don't need others to hold me accountable and you shouldn't either. If you're a true entrepreneur and you have the right attitude, the right work ethic, the right desires, and you're in pursuit of results, then you ... Again, like I said a minute ago, you have to own the mission. You've got to cut through any excuses and be accountable for your success, be accountable to yourself for your success. Kevin, jump in here for me on owning the mission and results and will to win and attitude. Kevin Hommel: Owning the mission, that's a good one. So I mean obviously when we talk about adding people to our company, one of the first things that our leadership team is trying to figure out is whether we'll get buy-in from them. It's not the easiest place to work, and so from our perspective that is pretty easy to tell. When you're talking to somebody, are they going to catch hold of what we're doing here and do we feel like they're going to support it when they come in? So that's for our staff of 90 now, when we add people, so you're talking to both the people that are going to work for entrepreneurs and the entrepreneurs themselves. I doubt you have too much trouble out there in the audience of the entrepreneur [themself 00:03:32] owning the mission, because usually it's their own self that came up with the mission. Are you asking about getting that filtered down throughout the organization? Kent Clothier: Well, again, a lot of entrepreneurs, as we've seen, they think it's easy to start a business, work a few hours a day, get rich quick, and move on to the next idea, the next startup, but it's really not like that. I know there's a ... Sometimes there's thoughts out there that being an entrepreneur is really easy and all you need to do it is a little seed money and you can get going, but it's really much more than that. Again, we started way back when with very little money, and eventually as our success grew and brewed over the years then the money came to us, and it still is today because of 14-15 years in the business and a solid base and years and years of results that anybody can look at. But most young owners today, entrepreneurs today, have to understand really ... And I've said this in other podcasts before, how hard it is. It's all on the entrepreneur that's stepping out there and starting it to own it. And again, the only person that is going to hold you accountable is yourself. Kevin Hommel: Yeah. So I see where you're going with it now. Because we say work smarter and not harder obviously means use your time wisely, but it also doesn't mean you don't have to work hard. So yeah, I think the stat is still somewhere around 99% of small businesses fail within the first five years or so. I'd say if you even go on to just down to one year, that I would imagine that stat is still close to 80 to 85% of small businesses that fail. Someone with an idea to start a company is ... As we've said on the podcast before, they're solving a problem that's important to them, and maybe that's the only ... Maybe that's as far as they took it. They didn't go on to figure out all right, how many other people is this important to that will pay me to do this for them? Or once I get past those first few people who said yeah, I'd pay for that, what's behind that? Is there a successful and a sustainable business model behind it? That's where the effort comes in. You might launch and you might have an immediate hit with a very successful first couple months, or even a first year, but not resting on that success, not sitting back and becoming complacent, to continue to put the effort in that I think most entrepreneurs probably want to do in the very beginning because it's exciting. Then when the excitement wears off, that's when you figure out who's really made of the right material. Kent Clothier: Well, and again a lot of entrepreneurs, whether they're young or old, that when you start to see some of the fruits of your labor, some of the success, and to continue to reinvest that money into your business and not pulling it all out. A lot of times entrepreneurs will go a couple years without making any money, and you have to be able to do that, because you have to reinvest in your company in technology, in people, in training, in better infrastructure. Even today in our company we're seeing that. We're still spending a lot of money every month on software, a lot of money on upgrading equipment, a lot of money on training. We're spending lot of money even as we speak on technology on some of the new stuff that we're doing. So it's a constant situation of continuing to move through to get to the mission that you're trying to get through, but it's a process that's going to take, depending on your company, years and years and years. If you can continue to scale that and get the results that you're wanting every year without a bunch of excuses ... And, again, you have to surround yourself with people that are going to give you their opinion, not get upset when you don't do all of their ideas, but you do listen, and then gather all that knowledge and all that information and ideas from your people, and then move forward with a decision that everybody needs to support, and onward and upward toward the mission. It takes a truly focused individual that steps out as an entrepreneur and realize that you may lose money before you make any money. Kevin? Kevin Hommel: And still be willing to put in the hard work to keep it going because it's something you originally believed in in the first place. So it's got to be not about the money for the entrepreneur in the beginning anyway. I think I've heard you say several times that it was about being different, it was about the service side of things that you ... Anywhere you go, you seem to bring back to stories to us, to our leadership team, or to our whole company about service experiences that you've had, where somebody went over the top, and you just find those things almost everywhere you go because you're looking for it. So anybody that meets you, it's pretty quickly apparent that it's never really been about the money. That's a side effect of or a result of the passion you have behind serving people, helping people, helping other people be successful. I'll never forget the couple of companies that have come in here, because we've always been an open book, to let them sit down and let them say, "Hey, what do you guys do?" We try to show them everything that we do and then ultimately we see them leave with man, I don't want to work that hard. I know you and Chris have talked about that on a previous episode, but yeah, it can't be about ... It can't only be about the money. It has to be ... The passion has to come from something else. The passion has to come from truly wanting to do something that no one else is doing, or truly wanting to solve problem that you believe no one else can solve. If that's the root of it, it won't stop because the money is there and it won't stop because the money isn't there. Kent Clothier: Well, the money will be there in the end if you do everything that you're supposed to do on the front end. If you do the right things, whether it involves people or vendors or your clients or whatever it is, if you do the right thing and you make good, solid decisions, not all of them are going to be exactly right and not all of them are going to work out, but all you need is more of them to work out than don't work out, and that in the end should lead you to making money. Again, it's ... And you used a word in there that I wish I'd of used earlier in this, and that's passion. That word has got to be in your vocabulary, because you've got to feel it, breathe it, and have that will to win every single day that you come in, because there's going to be days that are going to be up, there are going to be days that are going to be down, there's going to be days where you want to get out of it and quit and bail, which you can never do. You can never quit. You got to get up every single day and bring it, and realize that if you're chasing the dream, chasing the vision, and you have a plan, hard work prevails and pays off in the end. It just takes time for that to happen, and it's not going to happen overnight. Kevin Hommel: Yeah. There's a saying out there that if you love what you do you never really work a day in your life, because it's just ... And I don't know that I completely agree with that, because there are days even when we love what we do here that it's still hard work, but it makes the days go faster and it makes the years go faster, and it really just makes it to where it's all worth it when it is something that you're passionate about. That's back to the first thing that we talked about, the people ... Like when we're adding to our team. Those people have to buy into what we're doing, and if they do then it will show up in their work, which will then allow them to have more opportunity, which will allow them to make more money, and kind of like you said, the money follows. Kent Clothier: Like I said when we first started, you have to own the mission, and I'm accountable for the success and I can't depend on anybody else to hold me accountable. As entrepreneurs, we have to hold ourselves accountable each and every day. You got to get and bring it every day. As an entrepreneur, there's really, really no days off, especially when you're starting out and you're having to grind every single day to find your niche, to find your lane, to find your road and your path to this success. It's not easy, but it is doable and it can be done. It just takes a lot of hard work. So, Kevin, I know this was a short session today, and I wanted it to be that way, because I just wanted to deliver a message about owning the mission and dialing yourself in to be every single day focused, passionate, have the drive and the will to win, have accountability to yourself every single day. Anything else? Kevin Hommel: Yeah. I think just maybe a future episode we can talk about some ways where people can focus, because that's always a challenge. I've talked to a lot of people that let the business get in the way of them being able to have the clarity and the time kind of away from everything, so it may be a future topic for us. Kent Clothier: That would be a great topic. Again, to our listeners today, thank you for joining us. This was a little bit shorter podcast today. I want to thank everybody for listening. Hopefully there were a few ideas on here that you can use. As usual, you can find us on the memphisinvest website, SoundCloud, Stitcher and iTunes. Again, this is the Experience Matters podcast. We thank you for joining us today, and have a great day. Thank you.